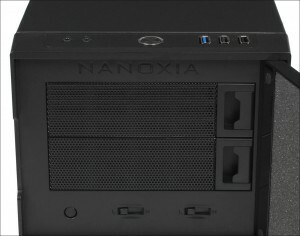 The acoustically lined compact Deep Silence 4 chassis from Nanoxia is a great micro-ATX chassis for smaller systems without any reduction in performance or cooling. 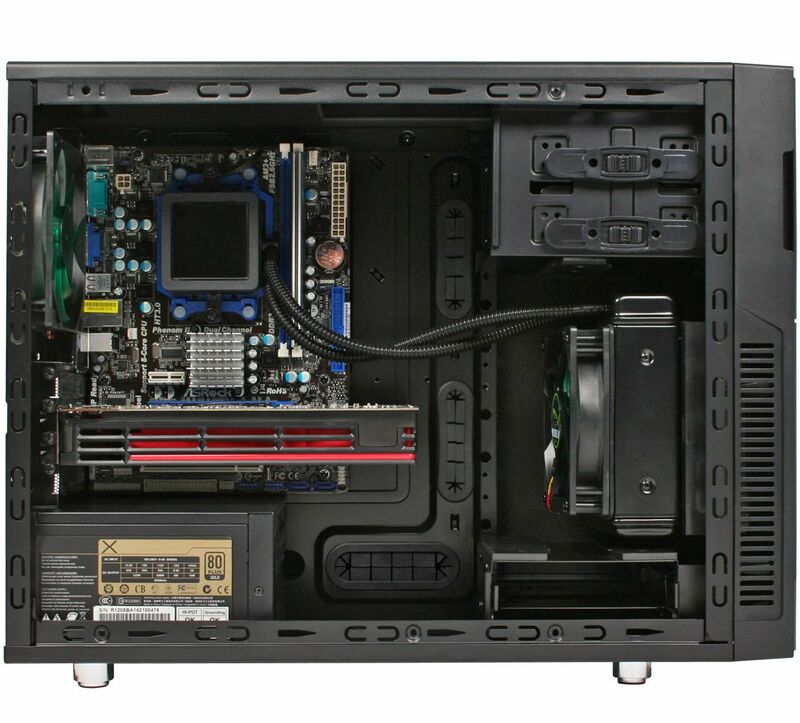 The Deep Silence 4 is the most compact case from Nanoxia's next generation silent PC cases. Despite its compact measurements, the Deep Silence 4 is compatible with many current CPU-coolers and extra-long graphic cards. Two modular HDD-cages guarantee the best possible compatibility for the most demanding projects. 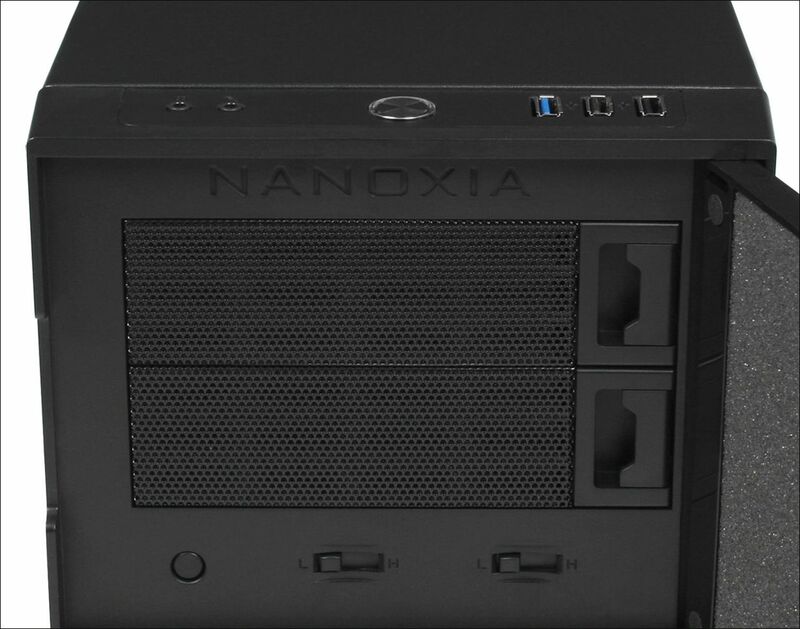 The guiding principle in the development of the Nanoxia case series has always been to create cases as quiet as possible at the lowest system temperatures. The Deep Silence 4 is fully soundproofed. Features like decoupled mounting of PSU and hard disk drives, as well as anti-vibration case feet are part of the sound insulation concept as well. The compact tower is manufactured from high grade steel. By using the highest quality materials, optimal noise insulation is ensured while providing a very stable environment for your PC components. The two preinstalled 120mm fans from the "Deep Silence" series are an important part of the noiseless concept. These quiet-running fans are designed for the best possible compromise between cooling performance and low noise levels. 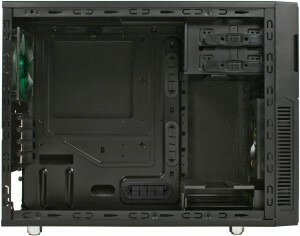 The chassis is also equipped with a 2-channel fan controller, which is standard for all of the Deep Silence case series. The integrated fan control allows the user to optimise settings to balance low system temperatures and the lowest possible noise levels, even at a full fan assembly. A Nanoxia VentCover is used to close the opening for a 120/140mm fan on the roof of the case. 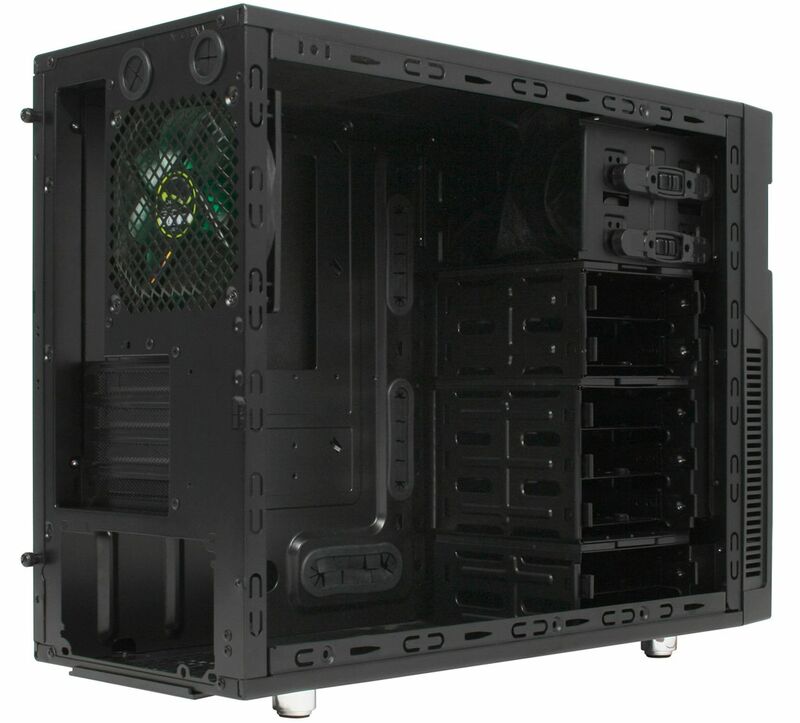 This allows the user to choose between improved cooling of the system by incorporating a further case fan or improved the sound insulation, by leaving the VentCover in place. One of the two included 120mm Deep Silence fans is mounted behind the front door, while the second at the rear of the tower. At 14.2 dB(A), the Nanoxia Deep Silence 120mm fans generate air flow of around 60.1 CFM and a static air pressure of 1.27mm H2O. 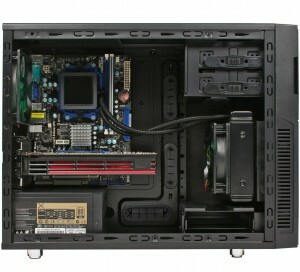 You can also mount a 120 or 140mm fan to the roof of the chassis. the intake fans are equipped with easy to clean dust filters, which can be removed for easy cleaning. 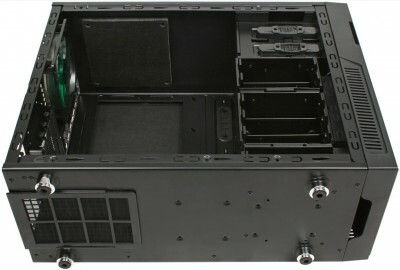 After removing the upper two HDD-cages, you can fit a water cooling solution with a 120 mm radiator behind the front. Another 120 mm radiator can be mounted at the back of the case. Two additional rubber hose guides for external water cooling solutions can be found on the rear of the case. 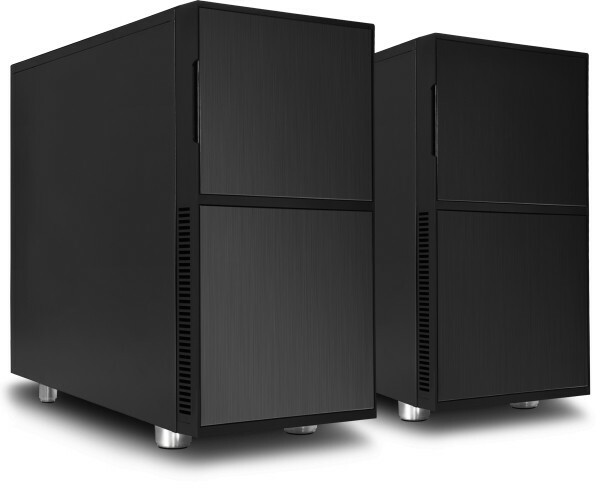 Two modular HDD cages for up to 5 hard disk drives are included in the Deep Silence 4. Another, permanently fixed cage for a single HDD brings the HDD-capacity of the case to six. For a maximum variability the modular HDD-cages can easily be removed. Due to this versatility, the installation of longer graphics cards up to a maximum length of 395 mm is possible. By removing unneeded HDD cages, the front fan can also more effectively cool the VGA cards. Mounting holes for the installation of an additional 2.5 inch drive bay can be found on the left of the modular HDD-cages, perfect to add an SSD. The hard drives are installed in special mounting trays, which are designed to accommodate both 2.5" HDD / SSD as well as 3.5" HDD. Screws with rubber suspension are used to hold the drives in place. 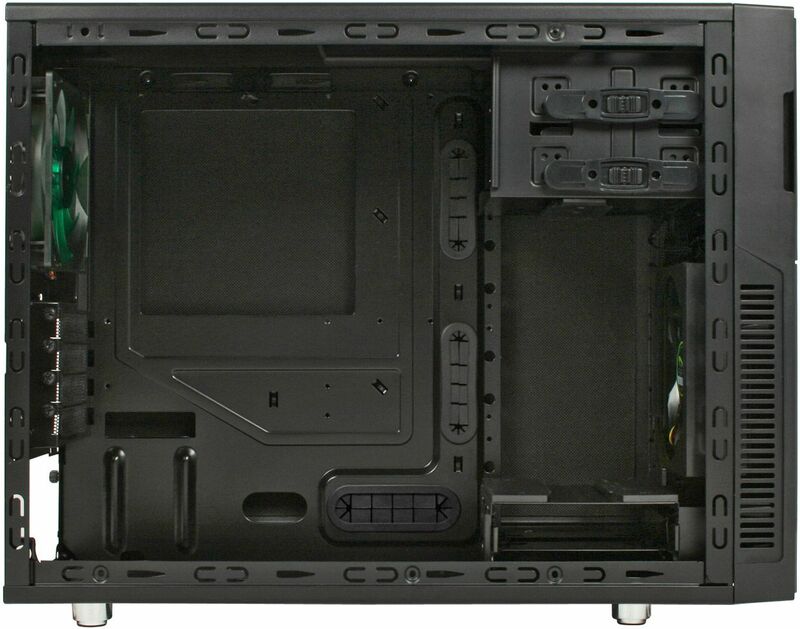 2.5/3.5 inch drive bays, internal 6x 2.5/3.5" and 1x 2.5"